Questions? Questions? Questions? Questions? Questions? 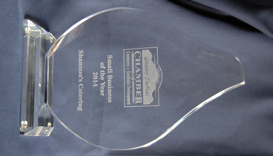 CLICK ON THE AWARD TO VIEW SHANNON'S CATERING 2014 - 2015 AWARDS! Serving the Central Pennsylvania Region including: DuBois, Treasure Lake, Punxsutawney, Brookville, Reynoldsville, Clearfield, Pennfield, Indiana, Cook Forest, Sigel, Corsica and other Central Pennsylvania areas.